CM 840 is a multipurpose trowelable patching compound for underlayments. 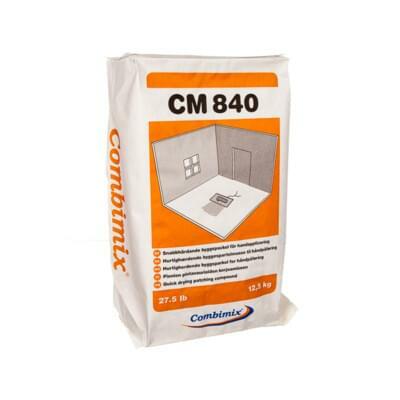 CM 840 can be installed on all types of concrete, well-bonded gypsum, bonded ceramic tile, quarry tile, Vinyl (non-cushion backed), VAT, VCT and PVC. Use Primer to block contact with gypsum-based surfaces. CM 840 is perfect for repairing cracks or creating slopes to drains. It may also be used on walls for repairs. The substrate should be clean and free of dust, cement skin, grease and other impurities that may prevent adhesion. Adhesion and surface resistance of the substrate should be no less than 0,5 MPa. Always prime the substrate with PP 600 and allow to dry before pouring (see PP 600 datasheet for proper dilution and installation directions). In terms of the primer forming a film, the temperature of the substrate must not be below 10 °C. For best results, the ambient temperature in the work area should be between 10-25 °C. At higher or lower temperatures, the time for curing will shorten or extend. Protect the product from excessive heat, excessive cold and draft conditions during and after the installation. It is recommended that the installation should be done with a proper air ventilation from an HVAC system. With the risk for cracks due to shrinkage or settings in the subfloor, a concrete surface should not be leveled within the first 28 days after casting. As a recommendation the RH in the concrete should have reached RH 90 % as the upper limit for applying the CM 840. Mix the dry powder with max 4.2 L of cold, potable water, max 28 %, per 15 kg bag. Do not overwater. Mix for 2 minutes with a heavy duty drill mixer (650 minimum rpm) to obtain a lump-free mix.Let the mixed CM 840 rest for 1 minute and then mix it for 1 minute again. Product may be refreshed by re-mixing but do not ad more water. Apply blended material onto substrate at a thickness of 0–50 mm for all surfaces by using a steel trowel. After initial set of material (approx. 10–15 min. ), remove any overlap marks, seams and inconsistencies by scraping with a steel trowel. Protect CM 840 from excessive heat or draft conditions during the curing process. Protect for up to 24 hours after completed installation. Material can be walked on after 30–45 minutes. Before covered by carpet be sure that the subfloor is dry enough. CM 840 is coverable after 1-3 hours. The guiding value assumes a curing temperature of approximately 20 °C, 40 % RH and proper air flow.